I don’t know about anyone else, but I have this mental list of places within driving range that I’ve always wanted to see but haven’t yet gotten to. Gradually, I hope to work my way through them as the fates (Money, Capricious Child and Time) allow. One such was Grates Cove. Now Grates Cove is an itsy-bitsy community with a population of 275, unless you could the folks in the cemetery. Then it would likely triple. You get the picture. Very small. 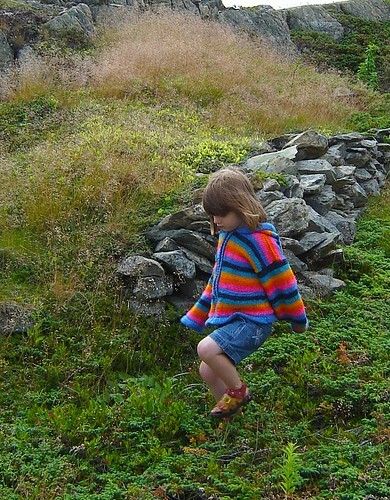 What put Grates Cove on my mental map, though, are the rock walls. 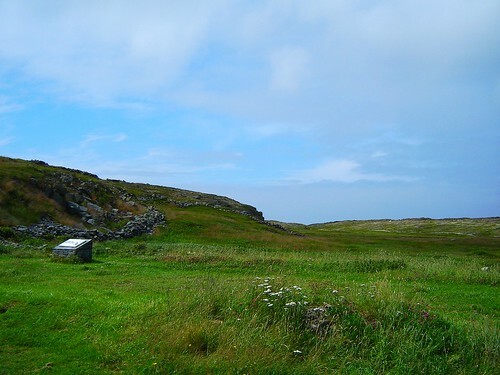 Newfoundland gardeners have, from time immemorial, hauled mammoth rocks out of their plots. We have generally piled them haphazardly along the edges of gardens to delineate who owns what land, define where crops are growing and simply to have somewhere to put the blessed things. Grates Cove takes this to an entirely different level of rockery. You see, all they have there is rock. When you live in an area devoid of trees (there was a massive forest fire in the area several centuries ago) and bountiful in stones, you find many uses for rock. 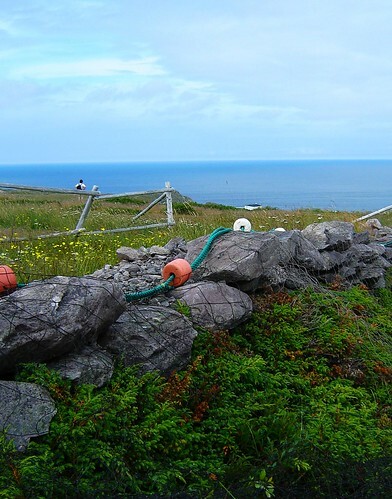 In Grates Cove, rocks were used to fence pasture, graveyards, property, and anything else that needed containment. 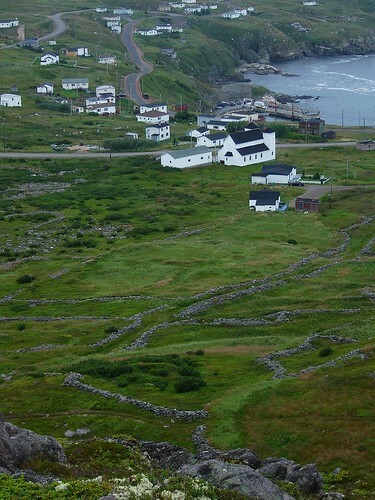 Grates Cove was settled by fishing families in the late 18th century. The settlement was located in a barren and exposed area with rock laden soils. In order to create vegetable gardens and hay fields, the rocks were painstakingly removed and incorporated into walls that served both as fences and property boundaries. The tradition of using dry-stonework walls to enclose cultivated land was common in areas with rocky soils in both the British Isles and North America. 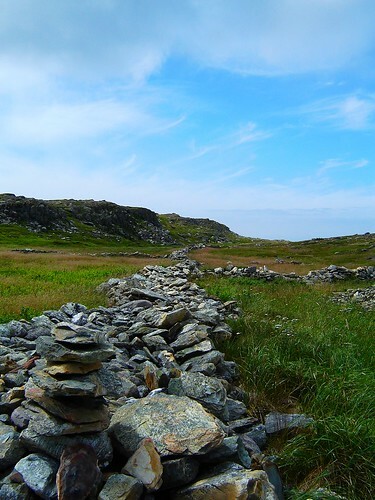 Rock walls were found in many communities in Newfoundland until the 1950s. Recently, most have disappeared, having been removed for new construction or lost in overgrowth. 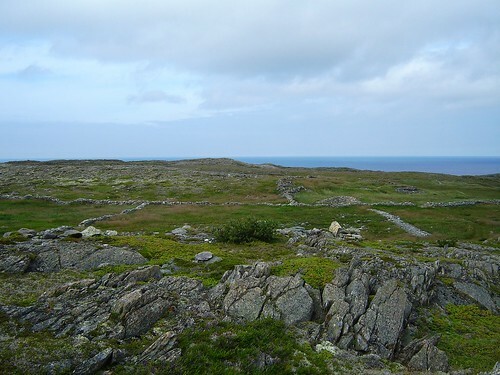 relics of rock walls are still evident in some places, but nowhere to the extent as in Grates Cove where they enclose 65 hectares. That’s 65 HECTARES, folks. 161 acres of vegetable gardens, graveyards, backyards, pigpens, root cellars, hayfields and simple property lines. As impressive as that sounds, it gets even more so when you realise that the walls were often several feet high and several feet thick. And built entirely by hand. Much of Grates Cove consists of areas of sharp-angled rocks broken from the underlying bedrock ages ago by frost action. Rocks were used in the construction of garden walls, retaining walls and terraces. Until the 1950s, most structures were built on rock foundations and surrounded by rock wall fences. In some buildings, small rocks were poured into walls for insulation and pest protection. Rocks were used in the construction of root cellars and in the construction of wells. Rocks also enclosed cemeteries and other community property. In Grates Cove many of the the enclosed areas are named and some have special local meaning. The Moonlight Garden was a favourite courting spot while good times are recalled in the Dancin’ Place. Grandmother Warren’s Spelling Rock signals a place for a welcome rest while Broderick’s Mash indicates family ties and use. So basically, when rock is you chief commodity and material, you use it for everything. The area is now a National Historic Site and the community nis in the process of developing a series of walking trails around the walls and to various lookouts and spectracular views. The signage isn’t great, though. We wandered around on top of Big Hill, thinking that it was the trail and view of the rock walls. To be sure, some could be seen, but the real tour-de-force stone-wise was further out on the headland. That we discovered quite by accident. you see, in the Travel Guide for Newfoundland, the Grates Cove Rock Walls National Historic Site and trails aren’t mentioned. The Cabot Rock Memorial is (more on this later in the post), but the most significant social and geographical phenomenon aren’t even spared a listing. Really stupid mistake on someone’s part. 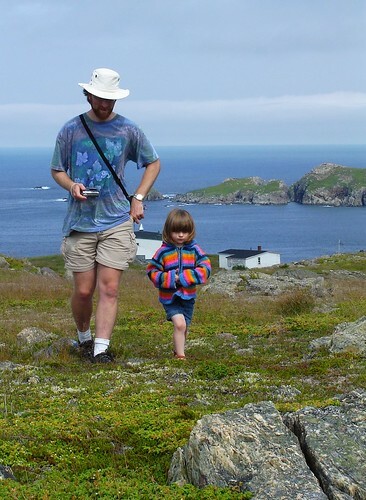 Once you get to Grates Cove, you have to poke around a bit to find out where to go. There are no good signs, no little maps saying “you are here (when you want to be there)” and really, no indication that there might be anything of interest , say, along the main road and off to your left. Once you do go along the main road and off to your left (or you can go straight to the end of the main road – there are several access points) , there’s a parking area, big sign, and a series of history boards telling you about the rock walls. As you can see, the walking isn’t difficult and the scenery is beautiful! Katherine thoroughly enjoyed the rock walls. They were pretty safe for her to play on, but some are a bit high and there are cliffs around, so keep an eye on kids and canines if you bring them. Especially if you go along the trail out past the little pond (there are apparently eagles out there, although we didn’t see any). Fish nets used to be seen everywhere. Now they’re enough of an anomaly that I thought them worthy of photographing. Rather sad…. Rocks are the most striking feature of both the natural and cultural landscape of Grates Cove. 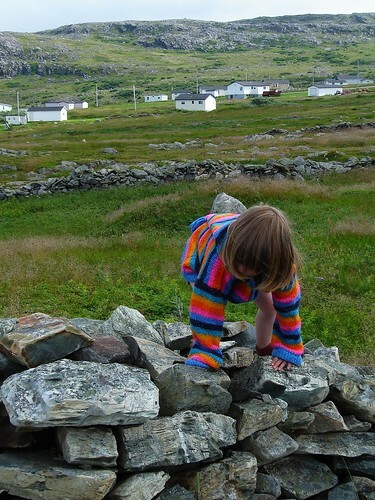 To build a house, clear a garden or make a path, rocks had to be moved. A perfect solution was to use them to construct walls. Three different types can be identified: piled (or thrown) walls; stacked walls; and built walls. A piled or thrown wall: A wall made simply by rocksbeing tossed in a pile to surround a garden. 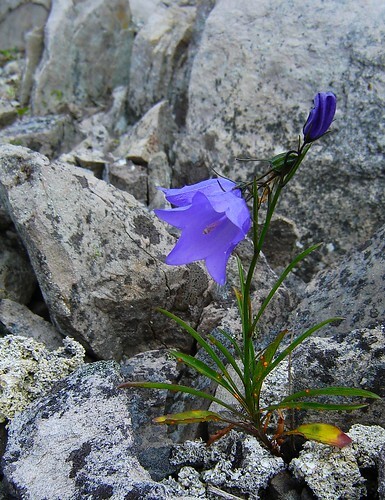 Although rocks varied in size, they were usually arranged with larger ones on the bottom or outside. Natural outcrops and very large boulders were incorporated into the walls and gaps became paths. A stacked wall: In some gardens more care was taken in sorting, stacking and balancing multi-sized rocks. Larger stones were placed to create a wall 90 to 120 cm (3 to 4 feet) wide. Higher than a pile wall, with wooden gates, it provided good protection from roaming livestock. A built wall: The most carefully constructed garden walls were 90 to 150 cm (3 to five feet) high, built with interlocking and balanced stones. Many had two faces, with the area between filled with small stones so that water could filter through. The built wall afforded good shelter from driving rains and high winds. 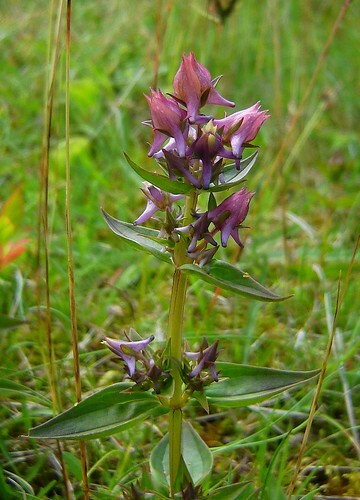 I also saw this purple flower in one of the grassy areas. Anyone know what it might be? The other claim to fame of Grates Cove is the Cabot Rock Memorial. Local legend has it that John Cabot stopped in Grates Cove once in 1497 and was shipwrecked there on his second trip to Newfoundland. There once was a rock that bore carvings perported to be made by Cabot or his son, but the rock was stolen years ago and is therefore not available for study and examination. The locals will all tell you that it is historical fact that Cabot and his son were shipwrecked and killed by indians near Grates Cove. The documentary evidence doesn’t seem to support such a claim, but many things are possible and not all old wives talesought to be entirely dismissed. As Gandalf points out in the two Towers, sometimes old wives remember things that everyone else ought to have. Whatever the truth of the matter, there is plenty of folklore to satisfy and a historically-shaped landscape that never ceases to astonish. there are no gas stations or food places in Grates Cove. The closest is the Irving in Old Perlican, whichserves good coffee, excellent sandwiches and takes Interac, Visa and MC (as well as cash). You can also buy alcohol in Old Perlican. the paved road to Grates Cove is very rough in spots. Previous Post A rose by any other name…. Were there any root cellars made from the stone in town? Whoops, I just read it above; thanks! Did they make any major buildings or houses out of the stone? Just one other point about the walls. Given that Grates Cove never had much of a population (there were much more sheltered harbours in Trinity Bay not too far away) it is even more impressive the number of walls they made. I visited Grates Cove once, and was so interested in finding the weather station that I didn’t even notice the walls or the signage (drat). Regarding your comment on the nets, I’m becoming more and more grateful that Dad used to drag me around the Southern Shore when I was a kid, and exposed me to the fishing life back when it was still the way of life. Some of them still used natural fibre nets, and I saw them barking the nets in Cape Broyle (smelly, smokey, and very rusty red shades). Thanks for this Vicky. I’m going back the next chance I get. I agree 100% about the read. Beautiful photographs! 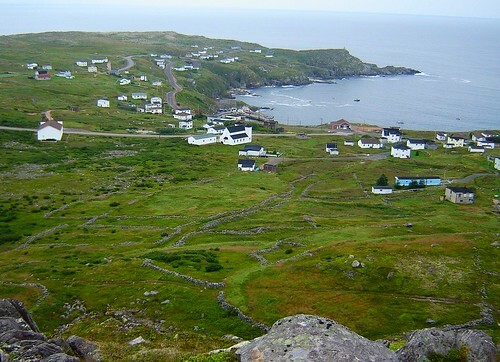 I feel compelled to go and see Newfoundland for myself. Thanks for the insight from a tourist. I have been working really hard on exposing the natural beauty that Grates Cove has to offer.We also have a replica fishing stage and cookhouse on the water edge. There is a boardwalk that will bring you to the gulch’s water edge so you can enjoy the feel of the ocean.There are mAny other sites of interest with the Molly shipwreak being of importance.Signage is next on the agenda.Plus opening in 2007 a cafe,gift shop and boat tour operation that is being called Beyond Baccalieu INC. Rental of a cottage is also available.I invite you to come back and look me up. Good morning, my partner/wife sent this site to me. Grates Cove has a connection with my background. I beleve my birth mother was born and raised in Grates Cove. Her maiden name was Margaret Duggan. Your site is super, the stone walls remind me of Ireland/ Scotland which I was lucky enough to view from low level flying in the 60’s. Judy and I reside in Nova Scotia and fly a Grates Cove Flag on our flagpole. Hey Rhonda, I’ll certainly be back. We were there early in the year, before the tourist stuff opened and before the grasses grew tall enough to obscure the walls. It’d be interesting to go back later in the summer. Daniel – glad you stopped by! Grates cove was an amazing place. I’m hoping to make it back this summer as I’d like to do a series of art pieces on the community. I can’t imagine how cool the walls would look like from a glider or low-level plane! MY DAD WAS BORN IN BONAVISTA IN 1901. HE TOLD ME HE LIVED AT BAYLEYS COVE. I HAVE NOT BEEN ABLE TO FIND MENTION OF IT ANYWHERE. ARE YOU FAMILIAR WITH IT? THANK YOU FOR SHARING YOUR PICTURES AND ALL THE INFORMATION YOU INCLUDED. IT REALLY LOOKS BEAUTIFUL IN YOUR PICTURES. I HOPE SOME DAY I WILL BE LUCKY ENOUGH TO SEE IT FOR MYSELF. 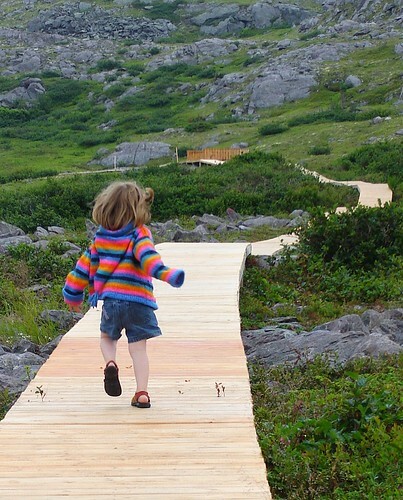 Thanks for a truly terrific article and pictures about our community of Grates Cove. If you ever come back to visit again, please stop in at our new shop, Beyond Baccalieu, in the middle of town, and we will take you out to see the eagle’s nest in the Heart Cove. It is one of the prettiest spots in our community, and unfortunately you missed it. You can look across the ravine and see right down into the nest, and most years there are chicks to see. While your comment about amenities was true until now, our cafe and gift shop is opening on June 1, 2007. So, there is a place for visitors to come in for a meal, use the facilities(!) and talk to us about the community. Thanks again for your blog. It is really well written, and a nice plug for Grates Cove. We want everyone to know about our wonderful community, which is truly unique to the Baccalieu Trail. Do you know a Trevor Snelgrove as i was boy hood friend of his back in the 1970’s? This is Jane O’Toole. We met several years ago when I was visiting my grandfather, Tom King’s, house in Grates, with my cousin Carol Maxwell. My Mom is Verna King. We went to a great party up at your house — where I was screeched in! We also went out fishing with Rhonda and Jim. Haven’t been back in a few years but just wanted to say hello. We’re related by my great grandmother Elizabeth Snellgrove King. These pictures were great and it’s nice to see the work being done in the town, including your opening of a store, cafe. Is this where the other store used to be located — at the ‘bottom’ I think it was called?? There’s a good chance that I’m related to both of you as well. My great grandmother was Elizabeth Snelgrove King. I am the granddaughter of Rebecca King Christie (2 September 1897) sister to Thomas. I know so little about this side of my family. My grandmother, Rebecca, passed away in 1993 in Boston, Massachusetts. She is buried at a Cambridge, Massachusetts cemetary. My mother, Jean Elizabeth Christie (daughter of Rebecca King and David W. Christie)just recently passed away at the age of 88 in Social Circle, Georgia. Rhonda — is that you Rhonda Duggan? This is Carol’s cousin, Jane. Wow, it sounds like you folks are doing some wonderful things in town. I’ve got to get back to visit soon. Hope this finds you all well. HI-MY GRANDFATHER AND GRANDMOTHER WERE PETER BENSON AND ANNIE SNELGROVE BENSON=MY MOTHER ENID BENSON CLEVELAND-I SPENT MY SUMMERS IN THE GRATES CLIMBING OVER THE ROCKS AND FISHING.MY MOST FAVORITE PLACE IN THE WORLD.HAVEN’T BEEN HOME IN YEARS-AM PLANNING ON NEXT YEAR -LIVING IN NORTH CAROLINA NOW. I CAN’T WAIT TO SEE WHAT HAS CHANGED AND VISIT WITH COUSINS. GLAD THAT OTHERS HAVE FOUND OUR LITTLE PIECE OF HEAVEN AS WELL.ALSO THANKS TO TO ALL WHO HAVE BEEN DOING OUR GENEALOGY ON LINE AS WELL. My Mother was Pearl Avery, one of several children to Joseph and Bertha Sellers Avery, any relatives out there? Glad that you are dong well.Its time for you to take another trip home to the beautiful Grates Cove.Our Cabot Rock Heritage is working hard in enhancing our fishing village.This in turn will attract even more people.We thank all who visit and spread the news that we are UNIQUE! My grandfather was from Grates Cove. Does anyone know how I may find the history of the Meadus’ that lived there 100+ years ago? Pictures were really beautiful. Would love to see Grates Cove someday. I too am a Grates Cove fan. I’m an artist and my interest is geology and geomorphology. I get a lot of inspiration in Grates Cove for obvious reasons! I never get out there as often as I would like. Your pictures are beautiful. How surprised i was to see a name i recognized on this blog. I am going to NFLD this year also, probably July. Of course i will be visiting Grates Cove, my birthplace. Joyce was excited about showing me the “Homestead” but most likely now will not be able to go. Who knows maybe i’ll see you there!! Hi My Nan was born in Grates Cove Newfoundland her name was Lydia Lambert and married Samuel Brown from St Jones’s within, spelling might not be right there. Anyways Im trying to do my family tree and Im wonderring if there are Lamberts still living back in Grates Cove??? I want to visit there when I come home this year 2008. My nan and pop raised their family 11 children in North West Brook. My great nan and pop are burried in grates cove. Im not really sure what my great nans name was my mom says she thinks it was Dianna Or Dina Lambert. My Uncle Clarence Brown is settled in Winterton which is close to Grates Cove. Hello from Grates Cove! As I am writing this note, I am presently sitting on my father and stepmother’s deck soaking up the sounds of the ocean and the occasional whale puff. I have been coming to Grates Cove since I was a young child, as my father’s family is from here. Now that I am grown, I find it very relaxing and refreshing to get away from my home in Nova Scotia, hence, the reason I am now here! Grates Cove is my Utopia and place of solitude! The scenery is exquisite and if you are adventureous enough, you can hike and explore to your hearts content. (No pun intended!) Every year I have had the pleasure of seeing whales and/or iceburgs and in combination, the smell and the breeze off of the ocean call to me, leaving me with a yearning to go back! Grates Cove will forever be in my heart not only because of my family roots, but because of its ability to sooth the tired soul! My grandmother was (Mary) Frances Duggan, so I’m related to Daniel, Rhonda and Jane, above. It’s a tiny world in the Grates! I haven’t been up since a family reunion in 1993, but the area was gorgeous, if stark then and the same now. There sure are a lot of hearty, kind people up that way – I didn’t feel like a stranger at all. I am a “Mainlander” from Toronto and I was a visitor to The Rock in 1980 and drove solo around the island for 3 weeks. When I explored the Avalon I visited Grates Cove and if my memory serves me right there was a sheer cliff with stages and flakes attached to it. They seemed to be no longer in use and were trying to fall down. I never took note of the stone walls as I have seen them in various forms all over the world and the significance of their existence in the area escaped me. Is my memory of the stages and flakes correct? When I left Grates Cove I travelled down to Daniels Cove and Old Perlican over the dirt road which I describe as a “Newfie Gravel” road (2 1/2 to 3″ stones/rocks) and second only to the one out to the Cape Race lighthouse. Hello, my grandmother, Elizabeth, was born in Grates Cove. She was the daughter of, i believe his first name was John and last name is Jolliffe. I don’t know my Great Grandmothers name. I have a great aunt Bessie, who I believe has deceased and a great uncle John who has also deceased. My husband and I are planning a trip to Greats Cove in the near future. Does nayone know if we have relatives still in Grates Cove. My aunt Bessie came and spent a month with my family many years ago and I know she has a son and daughter. I was in contact with them both but lost contact some time ago. My mother was Pearl Lydith Maxwell and she is deceased. Hi! 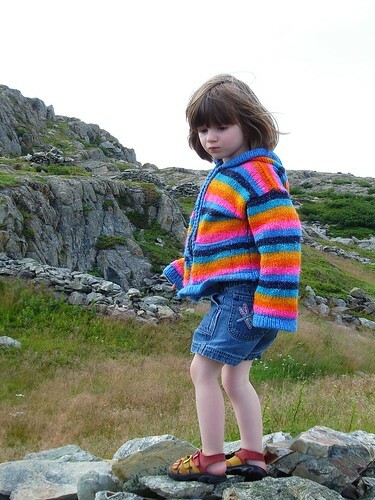 Loved reading your trip to beautiful Grates Cove. My husband and I traveled to NL 10 years ago on motorcycle for our honeymoon. I remember the bad road into Grates Cove. Once there I said ‘why would anyone live here – so isolated’. I always said I wanted go back to NL for our 10th anniversary – well that was this past June. So, we headed back on the motorcycle. This time we stayed in the Avalon region. Of course we had to head to Grates Cove. The road out is now nice and smooth. Stayed longer this time and walked the cliffs by the sea, saw the whales and chatted with some other ‘mainlanders’. Just loved it. We loved it so much that we just finished purchasing an old ‘salt box’ style house there. It is a real ‘fixer upper’ and we are very excited for spring to start working on it. I see it in one of your pictures. We never thought 10 years ago that we would own a piece of the rock! (Especially in Grates Cove). We have never walked the board walk and didn’t notice it until our neighbour told us about it. I take it that you are well settled in. My grandparents , on my mother’s side (Hayward and Emily Snegrove ) live there all their lives. My cousin Ray still lives there and you probably have already met. Anyway as a kid visiting my grandparents we truly found it a magical place . Pop would tell us ghost and fishing stories . I went back after 50 years and still remembered where they lived. William Douglas Martin and moved to Toronto ontario.